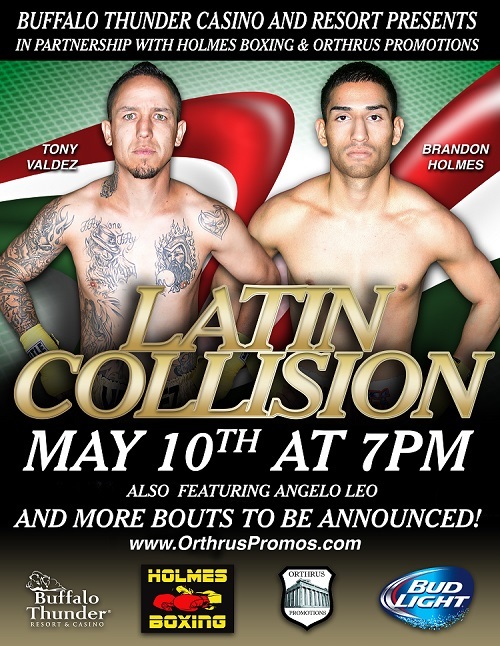 Earlier this afternoon, the weigh-ins for tomorrow night’s “Latin Collision” co-promoted by Holmes Boxing and Orthrus Promotions took place at the Buffalo Thunder Resort and Casino just north of Santa Fe. The card has now been reshaped to six-fights. If your interested in attending tickets range from $30.00 – $75.00 and can be purchased through the event hotlines 505-795-2772 / 505-699-2845 or through any of the featured boxers on the card. Doors open at 6pm and the first bout is scheduled to start at 7pm. For those unable to attend the fights tomorrow they are expected to air live on www.OrthtrusPromos.com. *Gonzales failed to make the 155lb +1 weight-limit. Fight will now take place as 160lb. bout.